Winter is full of festive events in the city of Toronto, which offers a variety of activities appropriate for the whole family throughout the holiday season. From dinner in a Victorian village to a holiday market in a historic district, festive parades to a celebration with zoo animals, there are plenty of ways you can celebrate the holiday month of December this year—right through to New Year's Eve. Whether you're traveling with family or on a solo trip to Canada, check out these seasonal attractions, events, and festivals and you're sure to add a bit of holiday cheer to your vacation or business trip. 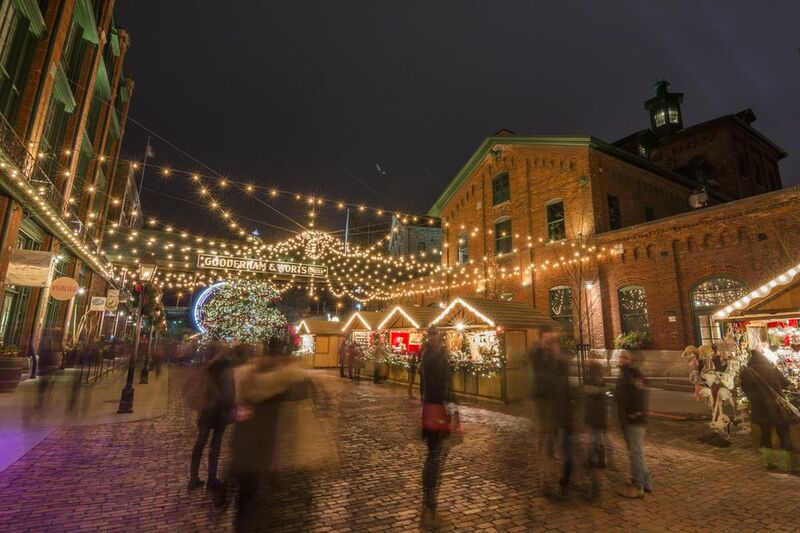 From Thursday, November 15 to Sunday, December 23, 2018, the Toronto Christmas Market returns to the Distillery Historic District for a month of holiday shopping, events, concerts, and activities. Rated as one of the top 10 holiday markets in the world, Toronto's annual market is open Tuesdays through Sundays (not in operation Mondays), with free admission during the week and ticketed admission on the weekends. The Toronto Christmas Market offers guests plenty of family-friendly entertainment, lighting displays, locally handcrafted products, walking tours, and of course visits with Santa. You can warm up with a cup of hot chocolate and treat yourself to something sweet, or there are also plenty of savory choices as well—the heated hospitality lounges allow for visitors to enjoy traditional Glühwein (mulled wine), craft beer, or a hot toddy. Toronto's revitalized waterfront comes alive with several magical light installations that will be lit from dusk until dawn each night from November 2018 through April 2019. Installations for this year include a spiral tree in the Peter Street Basin; a fire truck, stars, and snowflake motif at the Fire Hall; and an animated canopy of lights decorated with changing musical notes and harps at the Toronto Music Garden. You can access the Toronto Waterfront Business Improvement Area by streetcar, subway, bus, bike, boat, or walking; most of which you can take directly to Queens Quay, which provides immediate access to the BIA and waterfront. Santa visits Etobicoke —and there is a parade in his honor! A tradition since 1991, the Lakeshore Santa Claus Parade has been getting bigger and better every year and has become one of the largest community parades in the country. The parade begins at Dwight Streets and heads west along Lakeshore Boulevard West to 37th Street. Now in its 28th year, the Etobicoke Lake Shore Santa Claus Parade will take place on Saturday, December 1, 2018, starting at 10 a.m. Afterward, you can top off the fun-filled event with a few turns on the ice rink with Santa at Samuel Smith Park. You can step back in time into a Victorian Christmas at Black Creek Pioneer Village, an interactive museum and entertainment attraction known for its historical reenactments of early Toronto life. Located a few miles northwest of downtown Toronto, the Black Creek Pioneer Village will offer a traditional Christmas dinner every Sunday during December at the Half Way House Inn, with seatings at 1 and 4 p.m. on Saturdays and Sundays. Storytime with Santa is more than just a classic Christmas tale read by Old St. Nick—the kids will also spend the morning decorating cookies and creating crafts, followed by an afternoon of seasonal activities throughout the village, which all take place on December 15 and 16, 2018. Formerly known as the Kensington Market Festival of Lights, the 28th Annual Kensington Market Winter Solstice event will take place from on Friday, December 21, 2018, from 5 to 10 p.m. This participatory lantern parade is preceded by lantern-making workshops for those who are interested. Parade guests will meet on the corner of Oxford and Augusta at 6:30 for a 7 p.m. departure of the parade; lanterns will also be sold on Augusta Avenue from 5 p.m. until participants begin lining up for the event at 6:30. Starting on the day after Christmas, you can visit the Toronto Zoo every day as part of the zoo's Behavioral Husbandry Program's annual 12 Days of Enrichment event. The 12 Days of Enrichment starts on December 26, 2018, with a morning walk to see many of the animals enjoying Christmas treats provided by the staff: The polar bears will be nibbling on potent polar popsicles—fish and vegetables frozen in colored water—while the Bactrian camels will feast on a veggie buffet. There is half-price admission all day, but please bring a non-perishable food item for the food bank, and the day's proceeds will go to the zoo's Endangered Species Reserve Fund. 12 Days of Enrichment will continue until mid-January 2019 and will introduce zoo guests to the natural behavior of some of the zoo's most popular animal inhabitants. Each day, you can enjoy touring through the indoor pavilions, scenic walking trails, and diverse habitats with your family. There are several Christmas craft shows in Toronto where you'll have ample opportunities to do your holiday shopping while you're in town and hopefully be able to take home some unique, hand-crafted gifts for your loved ones. Although the popular City of Craft event that takes place at the Theater Centre is taking a year off in 2018, you can attend the Artisan's Gift Fair at the Annex every weekend in December leading up to Christmas to find some unique, quality, handmade gifts. The show runs Saturdays and Sundays from 12:00 p.m. to 6:00 p.m.